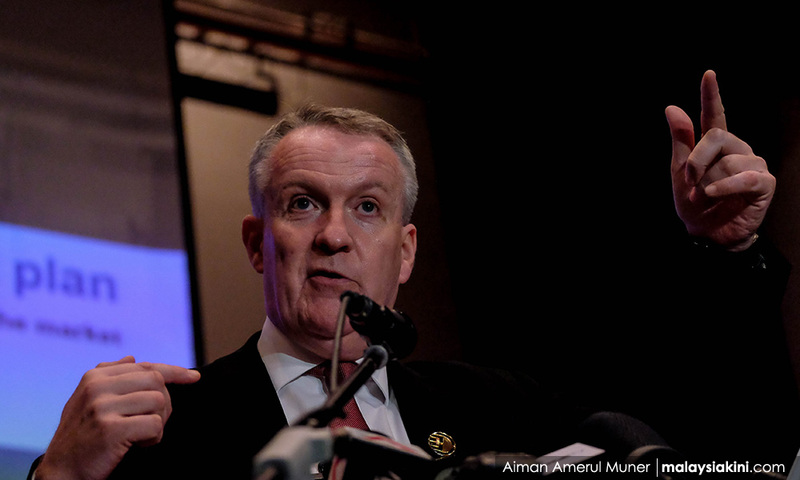 The statement that Peter Bellew issued yesterday about Malaysia Airlines System (MAS) and linking it to former prime minister Dr Mahathir Mohamad is proof how shallow and unprofessional this foreign CEO behaves and respects our policies. Bellew is not in an official capacity to defend himself since he has already quit the airline, now named Malaysia Airlines Bhd (MAB). Such a statement cannot be tolerated from a foreign CEO like him. Indirectly, he is insulting our national carrier and our previous government leader. Bellew should leave quietly instead, after announcing he wants to go back to Ireland, instead of trying to defend his reputation. If what others say is not true; he has the right to seek legal recourse. But why allow him to criticise our governance? Who is he, by the way, to talk about the previous issues of MAS as he was appointed as CEO of MAB. We cannot allow such thing to happen, allowing a foreign CEO to condemn our national airline this way or its previous management as he has no business, nor was he even in the management at that time. Bellew has been here only here for two years and yet he thinks he can criticise MAS or our leaders. This is shocking, where for the first time we witnessed a foreign CEO issuing press statements criticising our national airline business, saying how bad the airline was under the helm of Tajudin Ramli and Mahathir, who at that time was the prime minister. Is this acceptable? This is another slap on our face, where someone like Bellew can be given the stage on national news to criticise our national airline and former government leader. This is 'kurang ajar and Bellew should just leave Malaysia immediately if he does not want more problems here. It looks like someone is using him to raise all these issues - but is this the right person to talk about the previous losses of MAS? Was he here at that time when all these happened? He has no right to condemn anything, not even to talk about MAS, since he no longer holds any post as a CEO now. This is like allowing a foreigner who has been hired to do a job here but who, in the end, bails out halfway. Bellew is the talk of the town now as he is the one that gave everyone U-turn statements. To top it up now, he dares criticised our former government indirectly. We believe that Peter Bellew should check his facts before he makes such degrading statements about MAS.This form of statement made about our country's governance; past or present should not be condoned. This is an embarrassment to Malaysia as a whole. Bellew should apologise and leave quietly, since he has cut short his stint with MAB. He continuously made swinging statements about leaving the airline and now, before leaving, he is making a fool of himself again. It is no one’s idea to make him speak today, so Nufam is urging the government to investigate why Bellew has made the uncalled-for statement against a former prime minister of Malaysia. If Bellew can do this, then in future we will see more foreign CEO giving statements on national news, criticising our government and its policies. In years to come, more expatriates will condemn our system and governance if this is not stopped. Should we allow all this to happen? Bellew should immediately apologise to the government for his shameful public statements. Of course, everyone is angry because a foreign CEO that the government hired leaves and walks off halfway from his responsibilities with MAB. Indirectly, it’s an insult to Malaysians as a whole. We cannot accept a foreign CEO condemning our past and present leaders this way. If Bellew thinks that whatever has been said about him by any party is not true, he should just sue or just leave and ‘balik kampung’, as how he claims he wants to do. Nufam is the National Union of Flight Attendants Malaysia.